This week I knew that I was gonna have a super busy week..because I will be subbing the 5 days… plus with all the kids after school activities. I am also trying to finish decorating the house for Christmas and getting our Christmas cards mailed out. I needed to have this weeks menu with EASY and quick meals. This whole weeks meal will be done mostly in the oven…and since its chilly outside..I love baking and cooking things in the oven. I don’t think I will have time to stand in front of the stove. 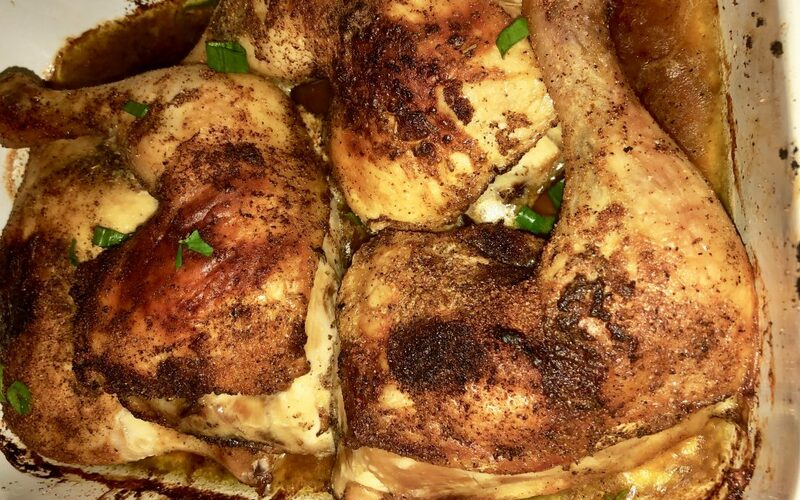 So MONDAY…we have easy baked chicken. We ate it with jasmine rice and steam broccoli. I rinse the leg quarter and PAT DRY with a paper towel. In an oven proof baking pan…lay the leg quarters in a single layer in a large baking dish and brush the roasted garlic butter all over the leg quarter…try to coat really well…I actually had to massage the butter with my hands. In a small bowl..mix the garlic powder, salt, and pepper until combined. Next, sprinkle both side of the leg quarters with garlic powder, black pepper, and salt mixture. Put the baking pan in the middle rack of the oven and bake UNCOVERED for 1 hour at 350 degrees. 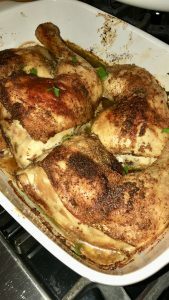 After the chicken cooked for 1 hour…I would basted the chicken with the drippings…then turn the oven to 425 and bake for another 15 minutes…so the skin could get a nice crispy brown. Once the chicken is cooked, removed the pan from the oven, and let the chicken rest for at least 10-15 minutes. Garnish with chopped parsley and green onion. Serve warm. You can find in the refrigerator section at any grocery store. 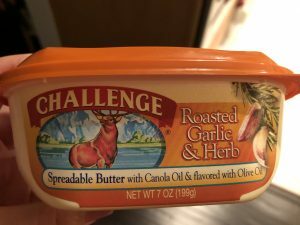 SIDE NOTE: If you don’t have the roasted garlic and herb butter…you can just use regular butter but add some fresh MINCED garlic to the chicken. I also add a tablespoon of this butter to my mash potatoes. Its so yummy.